This summer, we will be gathering as one community to learn and grow together—we call it Summer Study. We’re offering four different classes each focused on helping us mature as followers of Jesus in various ways, so check out the topics and class descriptions and sign up early to secure a spot. At the same time, we’re also putting on a sports camp for our elementary kids (ages 5 through 12). Childcare is offered for our youngest kids (under 5), and junior high and high school students are invited to attend a class or participate as helpers in the sports camp. Seriously, there’s something for everyone, which makes Summer Study a unique chance for our whole church to hang out and grow together as a community– you don’t want to miss it! Registration is $15 per person (includes the assigned book for your class and dinner at the Kickoff), or $40 for a whole family (3+ people – includes childcare and Sports Camp costs). 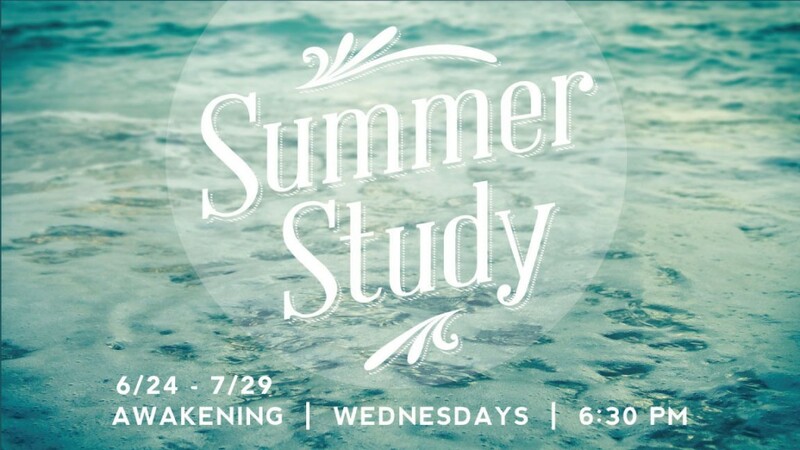 Schedule: Our Summer Study Kickoff is on June 24, beginning at 6:30 pm with dinner provided and ending at 8:30 pm. For the following weeks in July, come at 6:30 pm to to drink some coffee and hang out together; classes and sports camp will start at 7:00 pm and conclude at 8:30 pm. Cost: $15 per person (includes the assigned book for your class and dinner at the Kickoff), or $40 for a whole family (3+ people – includes childcare and Sports Camp costs). What are the core foundations of Christianity? What does it really mean to be Christian? What do Christians really believe? What makes the Bible unique and why do we care? What distinct traits and habits should mark the lives of those who follow Jesus? In this survey class, we will address questions like these and give practical, usable disciplines for any Christ follower. This class is for people who are exploring Christianity or new to Christianity, as well as for people who want to strengthen the foundation and practice of their faith so they can share that knowledge with others. Our aim in practicing theology is not simply to be story-tellers who speak about God, but instead to be story-dwellers who find ourselves caught up in the midst of God’s unfolding story. Theology is not stiff, boring dogma, but is instead an ongoing drama– which is acted out by the Church to bear witness to Christ. This class will deepen your biblical understanding as we explore how the entire story of the Bible is united in God’s redemptive work in Christ. We will walk through the story of God in four acts: Creation, Fall, Redemption, and Consummation. As we explore the unfolding story of God, we will apply each act of the gospel to our own lives in Christ and to the communities God has called us to reach. This class is for those who want to discover how the whole Bible and the Church fit into the story of God, and what that unfolding story means for us and our communities. Facilitators: Ryan Ingram, Michelle and Micah Woody, Christina Papoulias, and Steve Saccone. Loveology is just that—a theology of love. In the beginning, God created Adam, and then Eve. Ever since then, we’ve been picking up the pieces, trying to navigate all the challenges that come with doing relationships well in a broken world. In this class, we will dialogue about what is right in male/female relationships (what God intended in the Garden) and about what is wrong (the fallout in a post-Eden world). We will deal with sexuality, romance, communication, resolving conflict, establishing healthy rhythms, and how to see and affirm each other’s strengths. This class is for singles wanting to prepare for marriage, engaged couples, newly marrieds, and for all married couples who desire to strengthen their marriage. Many of us spend more time at work than anywhere else, which leaves us wondering what God intends for us to experience in and through our work. What does God say about work? How does the gospel change the nature of work? How do we integrate a biblical perspective and lifestyle at work? How does our work intersect with God’s mission in the world? How can we can relish and enjoy our work while honoring God and serving others? How do we know what kind of work we should be doing and how to act at work? We will look at these types of questions about work, and study what the Scriptures teach us in this arena of life. This class is for anyone interested in developing a deeper theology of work and discussing the surrounding implications for your life.